Matthew Stephen Beer, a former resident of Sun Valley, passed away suddenly on Dec. 7, 2010, in Santa Cruz, Calif.
Matthew was born in Boise, Idaho, on April 30, 1975. After attending Washington Elementary School and North Junior High, he moved to Sun Valley in 1989 with his mother, Meri Lynn Beer, where he fostered many lifelong friendships. Matt and his friends shared a passion for snowboarding and the mountains. Matt graduated from Wood River High School in 1994. After high school, Matt's adventures took him to San Diego, New York City and eventually Santa Cruz, where he made his home. 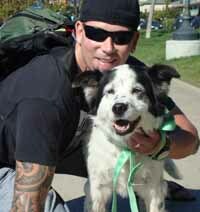 In Santa Cruz, Matt enjoyed the beach life with his dog, Loopy, and he pursued a career in the medical field. Matt was an inspiration to everyone he met. He touched so many lives in such a short period of time. Matt's only mission in life was to love his friends and family and to make a positive impact on everyone he encountered. That's it. That's what Matt did. Matt was a selfless, egoless and virtuous soul. Those who were fortunate enough to know him have very heavy hearts. Their angel on earth ran out of time. Their lives will never be the same and rightly so. Matt was preceded in death by his mother and will be greatly missed by his father, Stephen L. Beer; his stepmother, Nora Beer; his sister, Jennifer Beer (Jason) O'Keefe; his brother, Christopher Neff; his extended family, Mary Grandjean, Stephanee Rowbury, Jennifer (Terry) Miller and Kimberly (Jeff) Kenny; and countless friends. Rest in peace our great friend, lover, laugher and silly bear hugger, we will always love you. Services will be held on Tuesday, Dec. 21, at 6 p.m. at Whiskey Jacques' in Ketchum. In lieu of flowers, a fund has been established for the creation of memorial benches to be placed in his name in Ketchum and Santa Cruz. Donations can be made at any Wells Fargo office. The account number is 3343984161. If you prefer, checks can be mailed directly to Deida Runswick, Box 4010, Hailey, ID 83333.